In Radburn, houses are on small tracts arranged around a spacious common park, and vehicular and pedestrian traffic are separated. 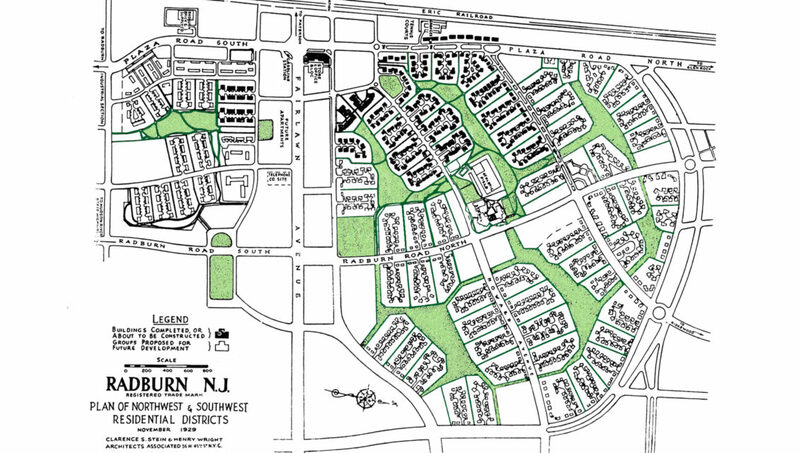 To ensure that further development preserves the community’s unique character and historic fabric, the Radburn Association asked Fradkin & McAlpin to develop and articulate architectural guidelines that would be not only consonant with the original aesthetic but also flexible enough to allow for change, upgrading, and future development. To ensure the guidelines are followed properly, Fradkin & McAlpin assists in interpreting them on an ongoing basis, as needed. Having this arrangement in place facilitated a successful outcome when Radburn’s signature commercial building was rebuilt after having burnt down. Other smaller interventions are review and negotiated with individual owners and/or their architects.